Backwards exit after a forward entrance two-footed transition. Recreational Racing – Learn skate technique specific for racing; such as the classic and power strides, the double push, lunge turns, forward crossovers, and brakeless braking. The student can also expect to learn how to skate in a paceline, and learn other skate event strategies and techniques. Pre -req. Able to skate on one leg or Robichon’s OSB 4. 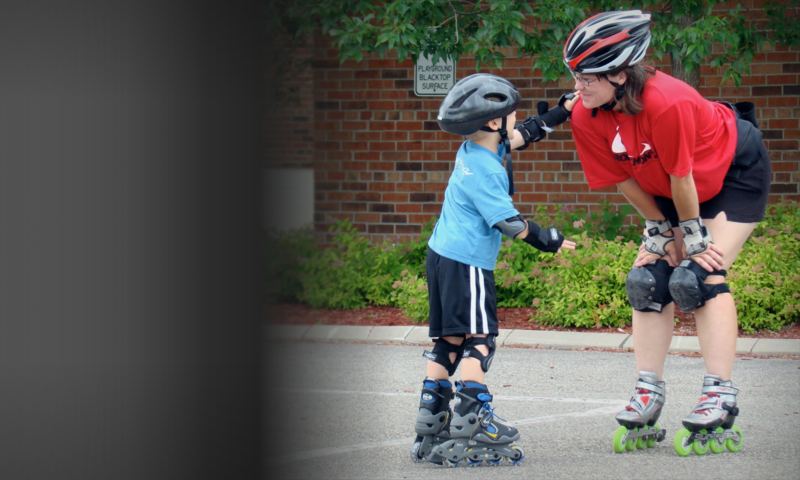 Roller Hockey – Learn-to-skate first. We believe mastering skills specific to hockey first blended with continuous development of power, agility and stamina is key to long term success of aspiring individual hockey players. Some specific skills we break down in bite size pieces are: hockey stops, hockey starts, power crossovers, hockey transitions. We blend in stick handling, passing, shooting, power and agility drills after skill technique development with positive outcomes. We believe strong emphasis on the importance of skating skill development as soon as the player becomes interested in the game will result in a stronger, faster and more confident player. Skate to Ski Cross Training – A great way to train in the off-season, use inline skates to crosstrain for ski season. Some Specific skills taught are: Both gliding and braking Inverted Y-frame turn and 2-footed and 1-footed slalom turns. Once introduced, we apply turns downhill. The course is adapted for recreational skiers and racers. Skating as a Workout/Stride Efficiency Development- Just getting on skates for the first time, is an effective workout. We can nudge up your workout with professional skate instructor guidance. Slalom Skating – Skating through cones performing front and back crossovers and one foot skating can significantly increase your edge control as well as skills on skates. Some specific skills you will learn through cones are forward swizzles, cross-over swizzles, one and two-footed slalom. Figureblading: American Dance- Learn ballroom dancing on inline skates or traditional roller skates. Bring a partner or roll with us solo. When you join us be prepared to have a ball (pun intended) learning: Progressives, Chasses, Swings, Glides, Strides, Cross-in-fronts, and 2 entry level dances: The Progressive Tango and The Glide Waltz.